I'm not much of a seafood eater, AT ALL, but I am sure some of you are so I can't deny the seafood eaters out there. Here's a recipe for you guys. I found this recipe on Kraft Food. -HEAT dressing in large skillet on medium-high heat. 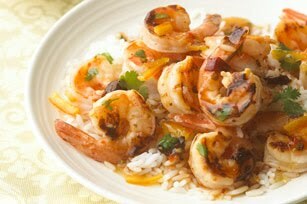 Add shrimp; cook 4 min., stirring frequently. -ADD marmalade and peppers; cook and stir 3 min. or until shrimp are tender. Remove from heat. -STIR in cilantro. Serve over rice.